Total Area: 1900 Sq. Ft. I love the curb appeal of this 1900 square foot, three bedrooms, two bath bungalow. 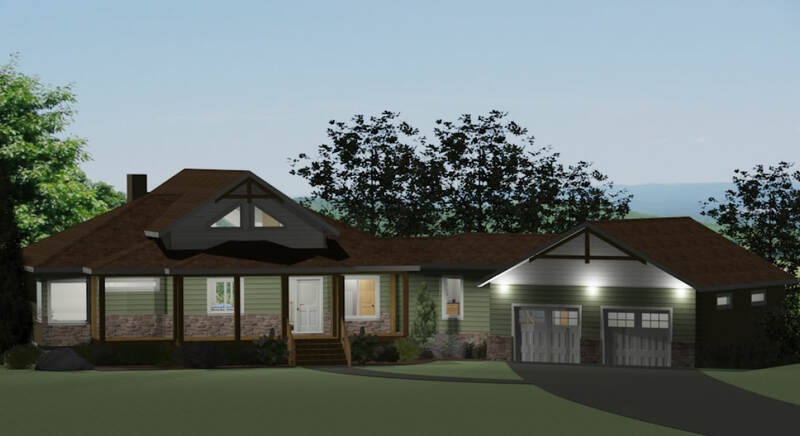 The covered deck and entryway with the 45-degree garage and matching timber gable details provides this home with a great look that is well suited to many different lots. Walking through the entry, you’ll immediately notice the 14-foot vaulted ceilings that run right through the kitchen/great room area from the front of the home to the back, ending at a wall full of windows that let in all the natural light and take advantage of the backyard views. The great room is centered around a wood burning fireplace and has plenty of wall space beside the fireplace, that is perfect for designing a built in entertainment unit. The spacious L-shaped kitchen has plenty of counter space for prep work as well as a walk in pantry for storage. The eat -in island is great for food prep, eating breakfast or entertaining on the weekends. 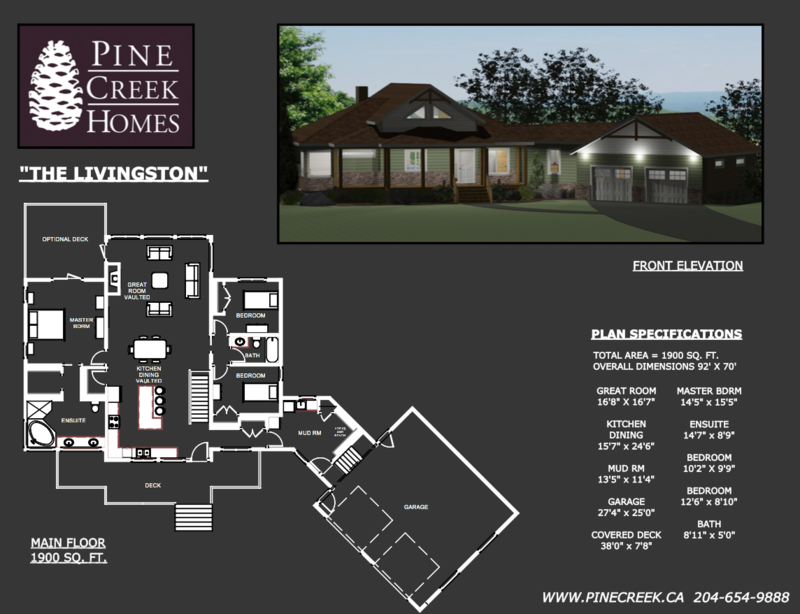 The master suite in this plan is separated from the other two bedrooms for privacy. It features a patio door that walks out onto an optional deck, depending on your landscaping plans. The master suite also features a large walk-in closet and an ensuite bath with a jet tub, custom shower, and dual sinks. The oversize double garage offers room for two vehicles, plus storage! It was originally designed to sit on a 45-degree angle, but could easily be modified to sit on any lot, as everything we do is fully custom. The garage walks into a large entryway that is full of coat hooks and benches. Again, this could be altered to have more closet space instead, but we’re finding that many clients find the coat hooks more practical and useful. There is also an option drawn in here for laundry (which could also be changed to add closet space instead).